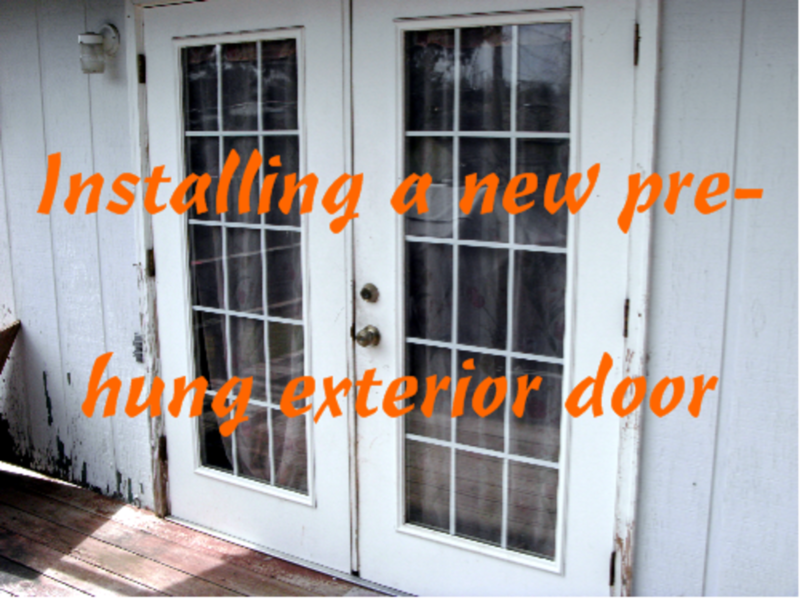 The steps in installing a prehung exterior door are much the same as with an interior door, and the instructions here are appropriate for either type. 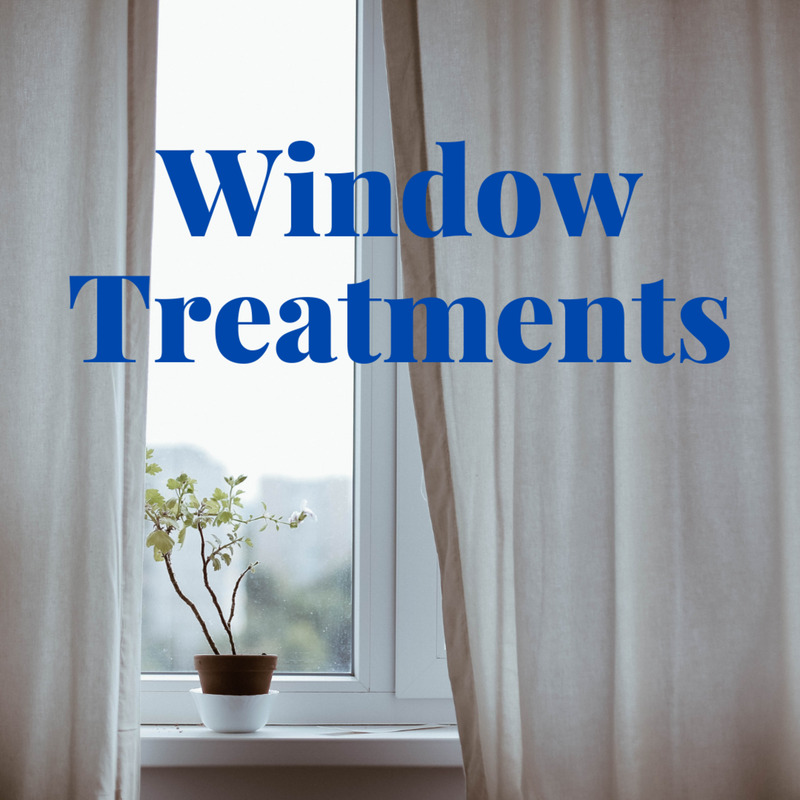 Replacing an exterior door will require a little different work on the exterior trim, will need some weatherproofing, and has a threshold to be concerned with, but that's about it. If you have a choice, prehung doors are very easy to hang. Hinges are already installed, and holes are pre-cut for doorknobs and locks. Door jambs are in place and fastened together. The entire assembly is fastened into place, trim installed (although brick mold us usually already in place as well) and the door finished with paint as necessary. 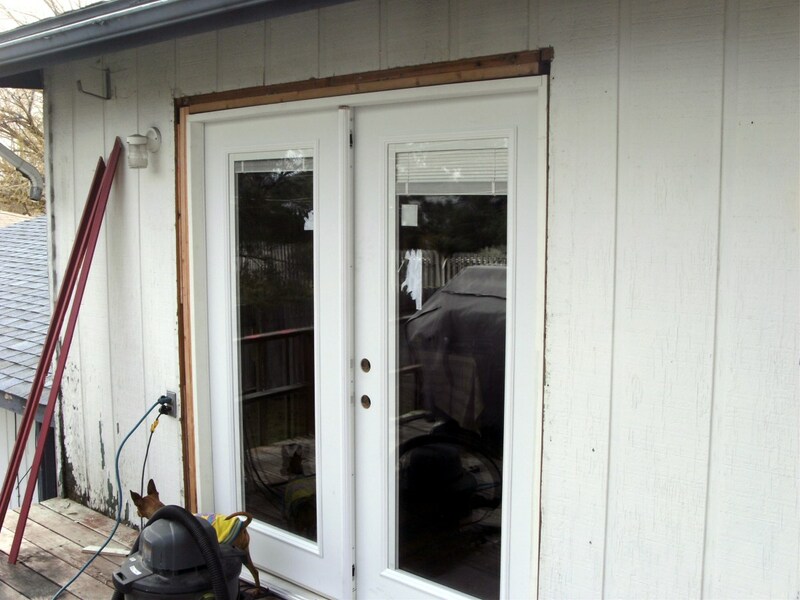 The photos used here are of a French door being installed, but again there is little difference between that and a regular door or an entrance door with a sidelight. They all come prehung in a door frame and all hang the same way. 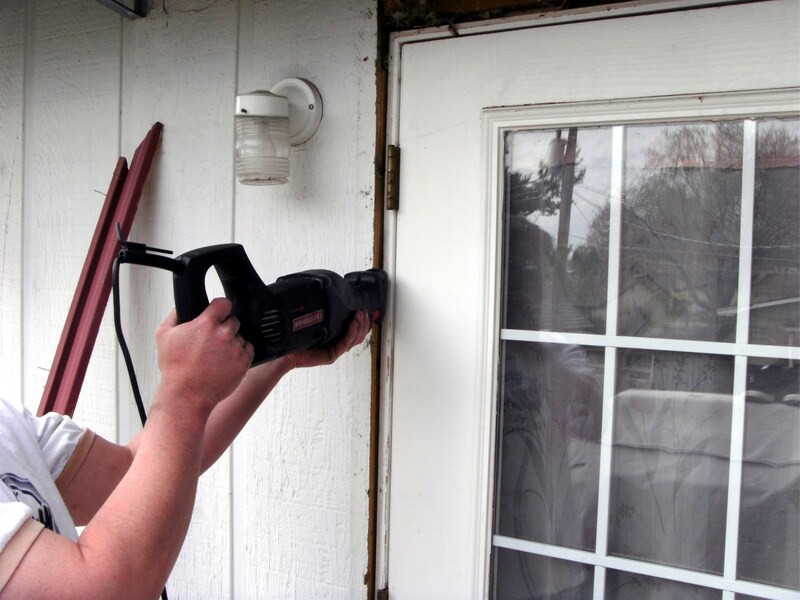 It might be worth noting, before getting into the heavy work of replacing an entire door, that a broken door frame can often be repaired quite easily, saving both work and cost. 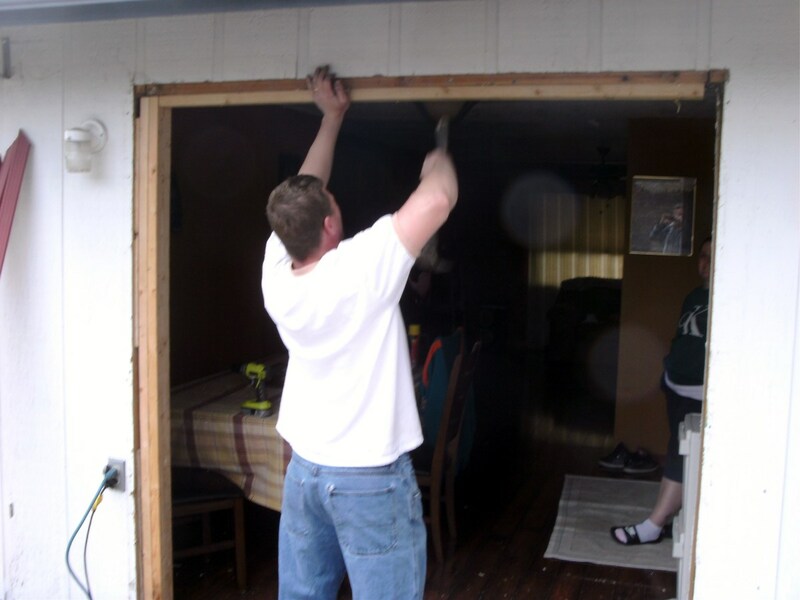 If you have decided to replace an entire door, however, or need to install a new prehung door into new framing, then read on for instructions. Gather all the tools and materials you'll need (see list below). Remove old door and frame (see the full description of which parts you'll remove and how below). 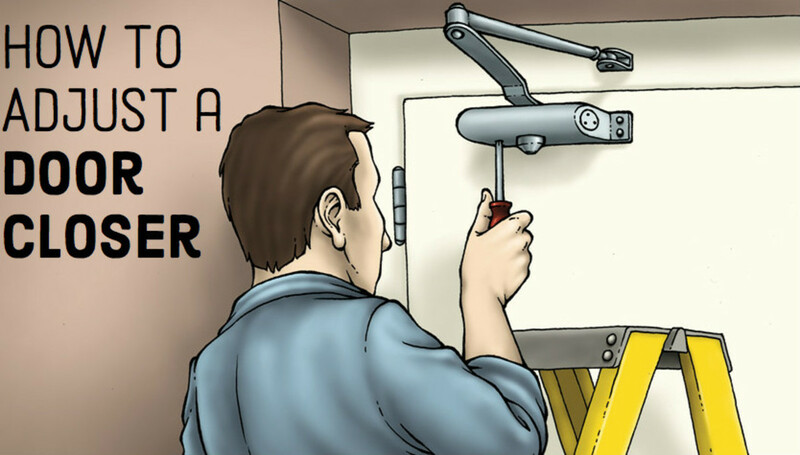 Hang the new door (read on for troubleshooting tips). Neither a great number of tools nor materials will be necessary, but there are some that are either very handy or required. Screwdriver, or preferably a drill or screwgun. A sawzall or hacksaw blade may be handy. Level, preferably a 4' framers level. A smaller level will work. Screws, either 2½" or 3" long in a #8 or #10 size. 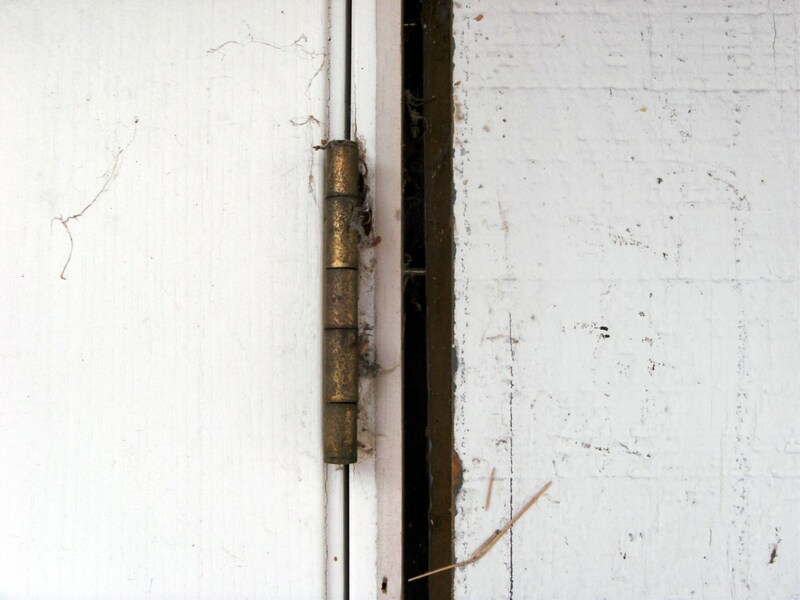 Try to find screws that match the hinge screws of the door. Latex caulk. Silicone will work, but often cannot be painted. Shims. These are usually available from a home improvement store or can be cut from scrap lumber. You will need a variety of thicknesses, ranging up to about ¼" thick. 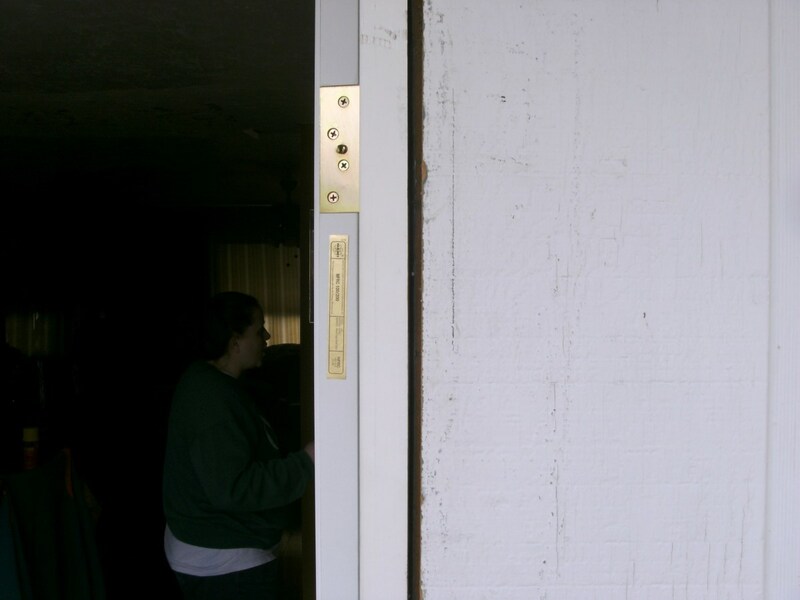 Begin by removing the trim on the old door, the casing on the inside, and the brick mold on the exterior. Both may be reused if removed carefully without breaking them. Using the prybar, pry the molding from the door and wall. It will be very easy to damage sheetrock on the interior; try to pry from the door side. Pry the casing out a little at a time: if one end is pried out and that end is used to pull the entire piece off, it will likely break. The interior casing is most likely fastened in place with finishing nails and should come off with little effort. The exterior molding (called brick mold) may be held in place with screws. Examine it carefully and if any screws are found, remove the screws. Using the prybar, again carefully pry the brick mold off and set aside. The sides of the door are now exposed. Look carefully for the screws and/or nails fastening the door frame to the studs behind it. Remove any screws in the sides, top, and bottom. 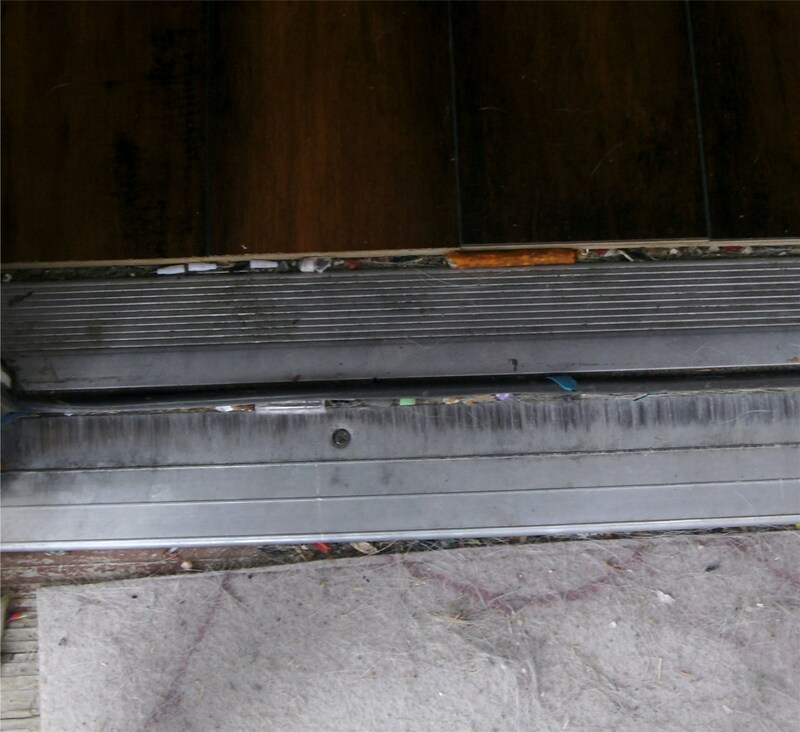 The threshold is usually held down with screws. 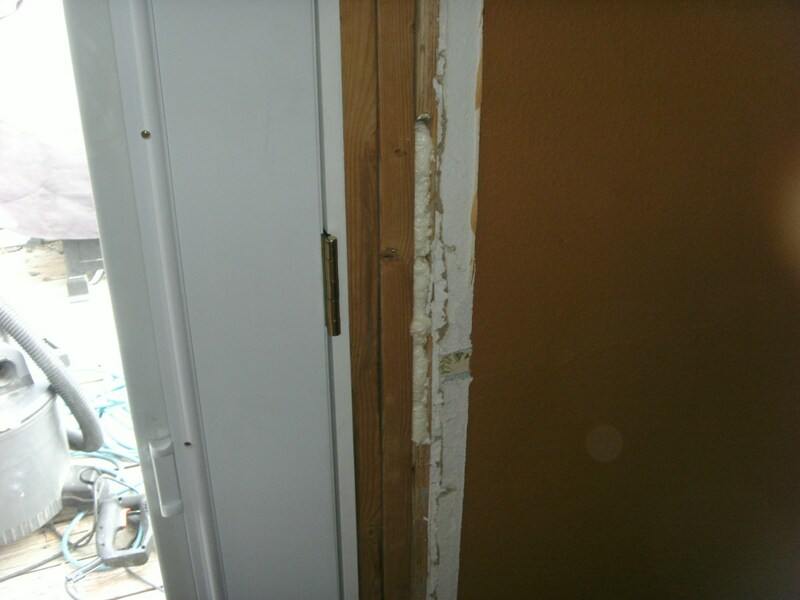 If the door frame is held in place with nails, it can be pried free with the crowbar, but this will most likely destroy the frame. 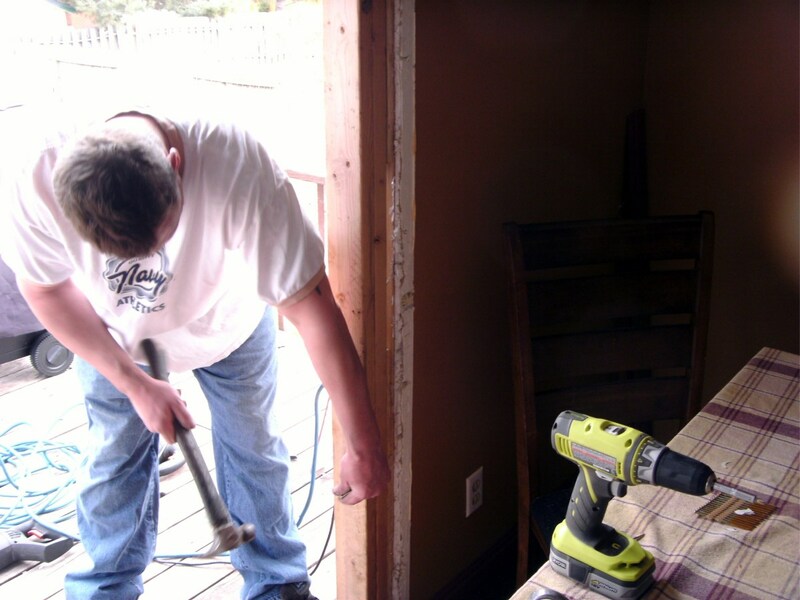 In the pictures, the door and frame was to be reused elsewhere; a sawzall was used to reach into the gap between the door frame and the stud and simply cut the nails off. A bare hacksaw blade can be used as well, though it will take a little more work. With the door free of the studs, tip the entire assembly to the outside and set it aside. The door and door jamb will come out as one piece, so make sure the door is closed (and preferably locked) so that it doesn't swing open during removal. 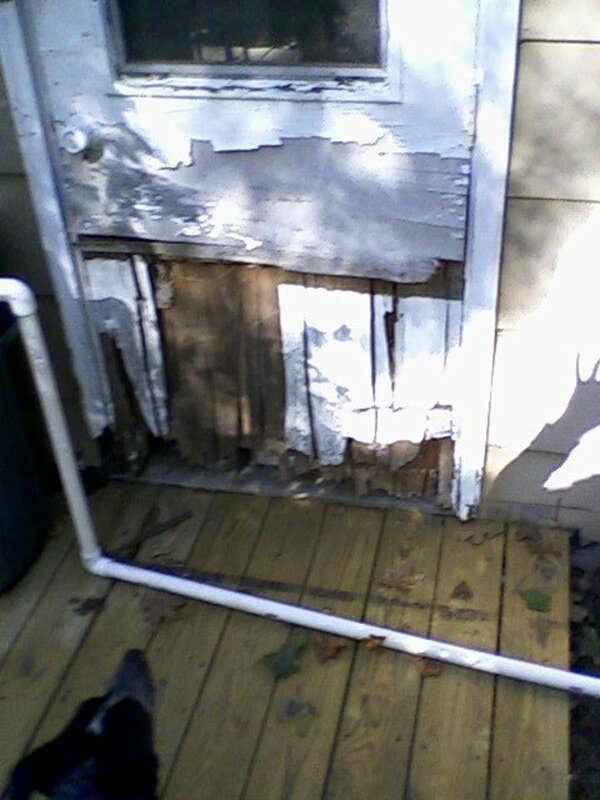 With the old door out of the way, clean up any debris. Brush down the exposed studding and either remove or drive in any exposed nails. Make any repairs necessary to the framing; older construction particularly may need a little TLC here. The floor under the threshold in the pictures, for example, was in very poor condition; it had not been installed correctly 30 years ago and support for the threshold was nearly nonexistent. Expect to do some repairs on older homes. Carefully measure the new door frame and the opening. The opening should be about ½" wider and ¼" taller; ideally there will be ¼" of space on both sides and the top of the door after setting it into place. 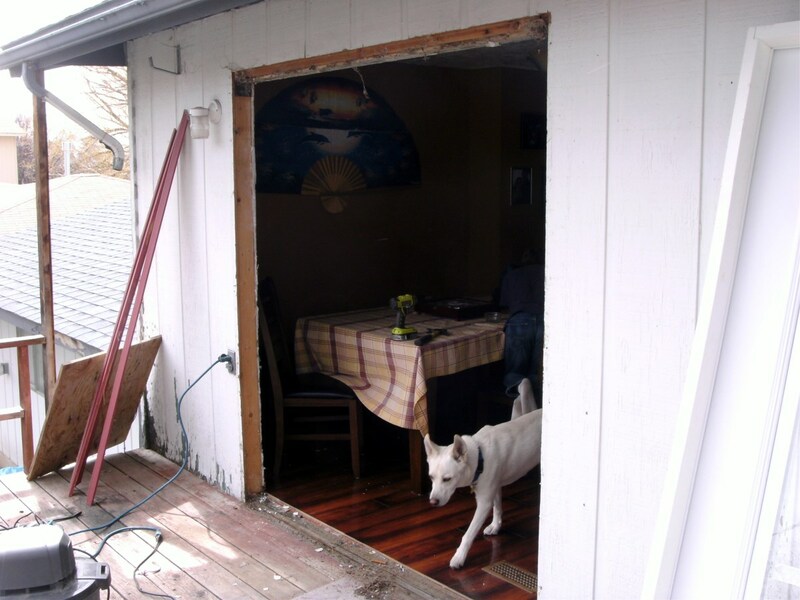 In the photos, the old door was several inches wider and taller than the new door; additional framing had to be added. If the opening is too small it will have to be re-framed and, as it is likely a load bearing wall, is probably best left to a professional. It's one thing to nail on a couple of extra studs as is done in the photos and quite another to remove the side studs and door header (that is holding the roof up), cut the opening wider, and re-frame both the rough door opening and header. 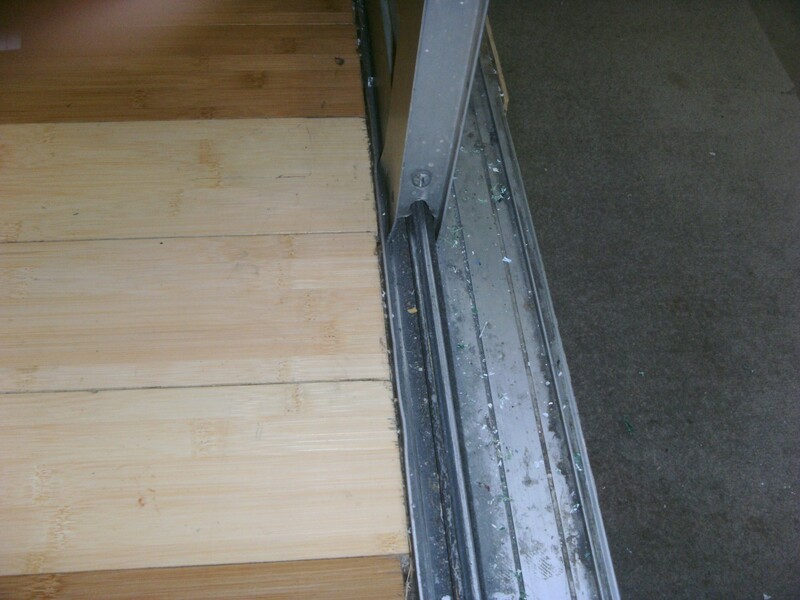 Remove any shipping screws from the door and jamb. 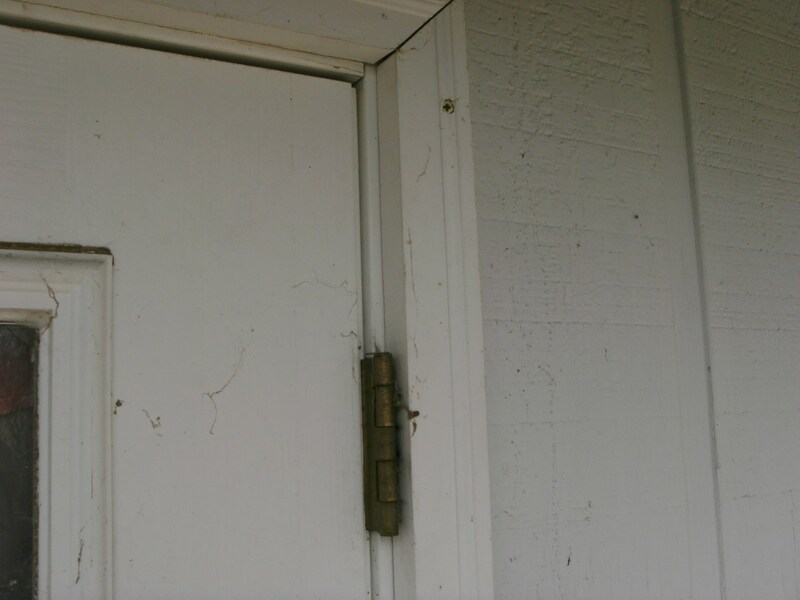 There is likely a screw at the top to keep the door from opening and there may be other braces intended to hold the door and jamb together during transportation. Open and close the door to make sure it will open; installing the door only to find that it will not open because it's screwed shut is not what you want to happen! Slide and tip the new door and frame into place; an extra pair of hands will help a lot here. 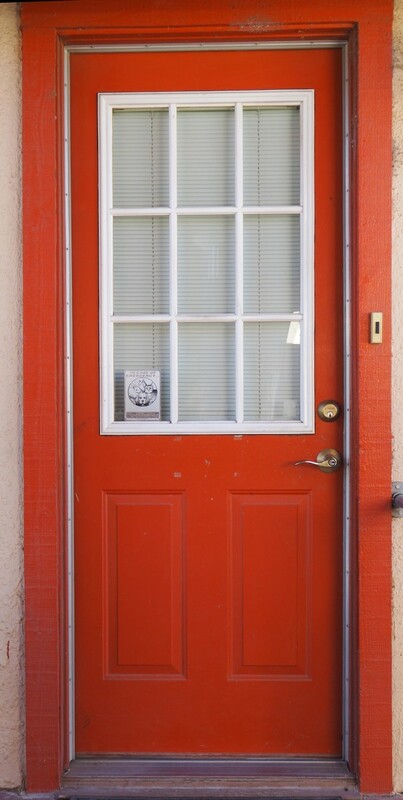 If an exterior door, take care not to bend the threshold at the bottom when you tip the assembly; it is easy to either bend it or tear it completely off the frame. 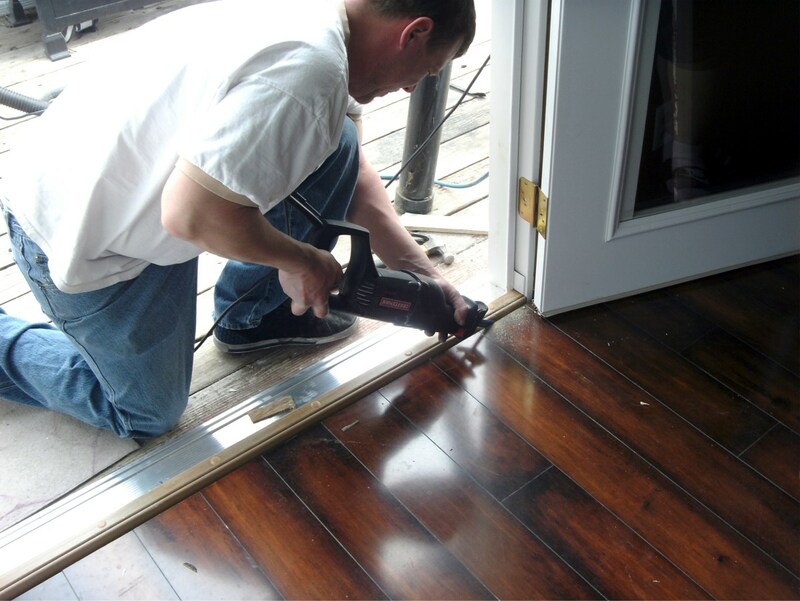 Make sure that the door will clear any flooring, especially any hardwood flooring that has been installed after initial construction. Such flooring may well be higher than expected. Check that the hinge side of the door is plumb - that is perfectly vertical. Likely it will not be as the floor may not be level or the studs on the side may not be vertical. Holding the door frame in place, open and close the door a couple of times. Check that it opens easily and that, when closed, the gap on the knob side is even all the way up. 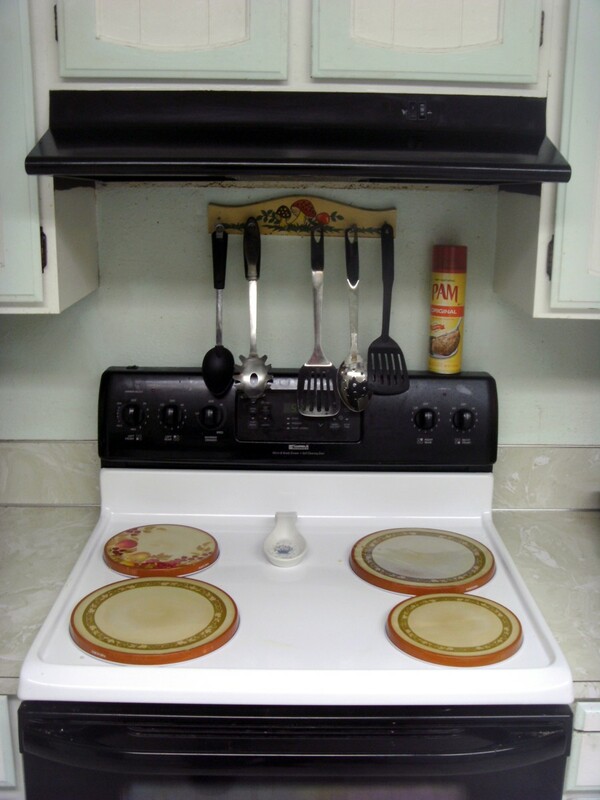 If it is not, "rack" the frame slightly; push either the top or bottom (but not both) slightly to one side. Recheck that the door opens and closes well and that the gap is even. Repeat as necessary. With the door positioned, it's time to fasten it in place. Start at the hinge side; remove one of the screws in the center hinge and replace it with a 2½" or 3" screw. This is where the drill or screwgun will come in handy - it will be much easier to drive those long screws with a drill than with a screwdriver. With a shim the exact thickness as the gap between the jamb and the stud, drive the screw through the shim and into the stud. Just snug it - don't tighten it fully yet. Re-check that the door opens and closes properly. Repeat with the other two hinges, one long screw per hinge, and re-check the door swing. Tighten all screws, but not to the point that it bends the door jamb. 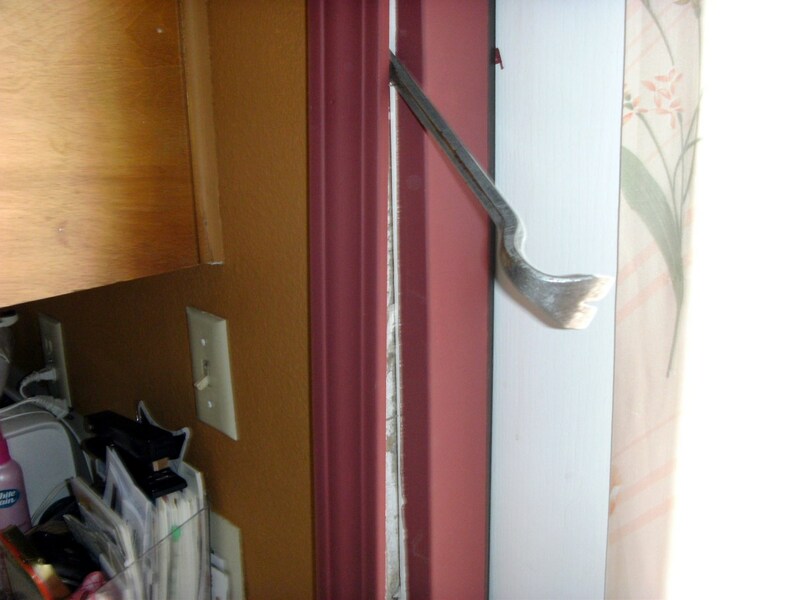 On the other side of the door, the weather stripping can often be bent back, allowing just enough room to drive a screw and cover it with the weather stripping. Repeating the process with the shims, put three screws through the knob side of the door jamb, through a shim, and into the stud, checking the door swing with each screw. Tighten the screws and, again using shims, drive a couple through the top of the jamb. Screw the threshold down to the floor beneath it. Check the door swing a final time; the whole frame can likely be "tweaked" a small amount if necessary by tightening specific screws or, at worst, changing out a shim for a thicker or thinner one. 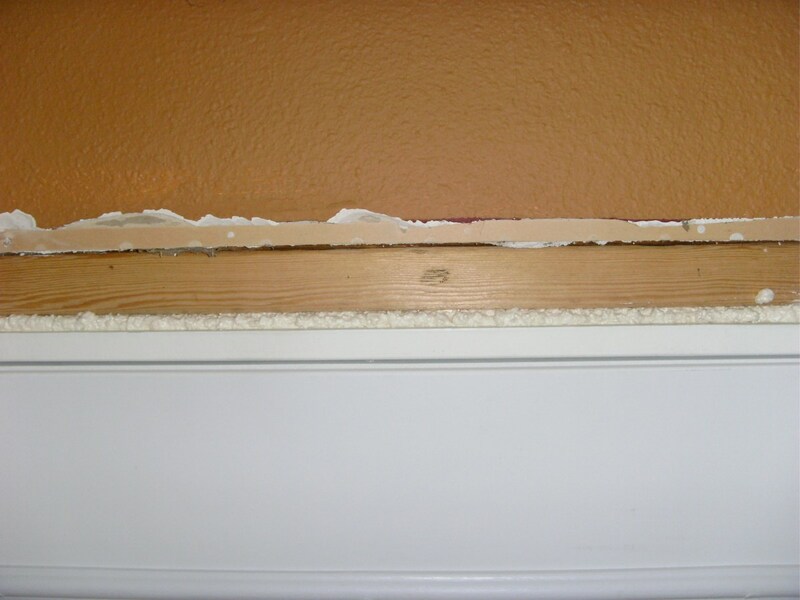 Using the expanding foam type of caulking, caulk the gaps between the door jamb and the studding. Take care not to put too much foam in; it will expand and can push the jamb out, bending it. Trim any excess with a knife. Re-install any molding that was removed or, as necessary, cut and install new casing and brick mold. Interior casing should be nailed on with finishing nails, while brick mold should be screwed into place with several screws on each side after caulking the area with latex caulk. Installing most pre-hung doors will include painting but not priming as they come pre-primed - choose your color and paint. 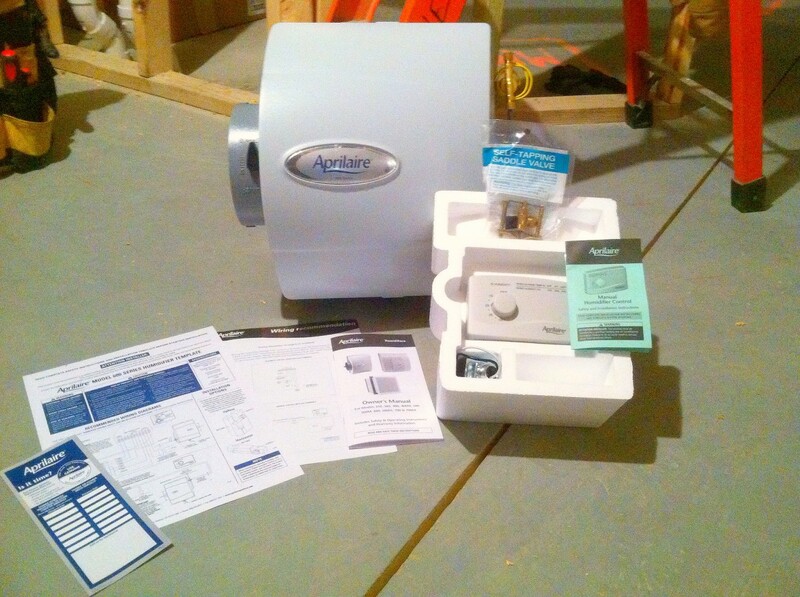 You're done, although a very popular and useful accessory is a new storm door to go along with the new exterior door. The job in the photos took around 4 hours for two people. It would have gone some quicker, but the extra framing had to be purchased, cut and nailed into place. It still needs molding installed as well, but that will mean some sheetrock work inside as well as additional siding installed outside; this door was nearly 4" narrower and 2" shorter than the one that came out. 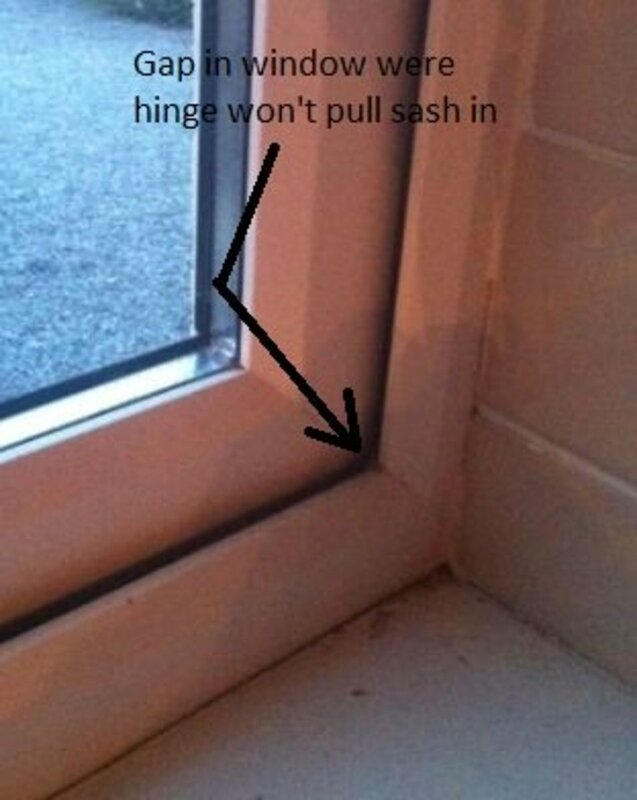 You are unlikely to run into that, but it is always a possibility with older homes. Doors are pretty standard today, and unless you are willing to pay for a custom made door you will have to take what is available. OK, Mara. Hope your dad does will hanging his door. LOL I deleted it, monkeyShine. And thanks for the comment. I hope it works for you, Susan - it real isn't difficult at all to hang a door, particularly if it is already prehung in a frame. Just point him to the hub and crack the whip! @rebeccamealey - glad you liked it and hope you will find it useful one day. I write to help people; if you do use it one day to hang a door I will be paid back for the effort. What a handy handy Hub to have on hand! Sorry for all the corny alliteration, but it's the best way to describe this one. Thanks! Voted really useful! This is so helpful to me or to hubby right now as we've had a semi-used patio door sitting on our porch for 6 months now and I want the darn thing installed. I'll make sure he reads your hub.